Hope everyone is having a very Happy Thanksgiving! Here is a quick post of my Thanksgiving nails - we've got to hit the road to make it to my in-laws in time for turkey! My nails today started off with three coats of OPI Pros and Bronze and was topped off with two coats of Hit Polish Thankful, a gorgeous clear-based glitter full of different sizes and shapes of yellow, brown, and orange glitter. 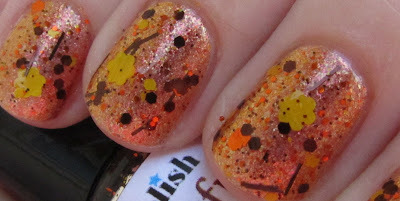 My favorites are definitely the yellow flower glitters - so much fun! I know I have been saying this for awhile now, but I really do plan to spend some time getting things going here again in the next couple of days. Check back this weekend (probably Sunday) for a catch-up post including Giveaway Winners as well as the polish I wore for Halloween.... it may be almost a month late but it was really cool so it deserves to be up here anyway, haha. Love the look. The flowers are very cute.